The financial market participants are well aware of the fact that geopolitical and economic news is primarily responsible for the changes in the value of a traded security. Based on the nature of news, traders usually take a long or short position in a well-monitored security. As far as economic news is concerned, an interest rate announcement is one of the most tracked data. Interest rates have a profound impact on the value of a currency. The reason is that interest rates ultimately determine the flow of capital into and out of a country. An increase or decrease in the interest rates announced by the central bank of a country will immediately impact the currency value of the corresponding country. However, the interest rate decision announced by the Federal Reserve, the central bank of the USA, will create huge effect in the value of almost all the free-floating currencies. The price movements seen during interest rate announcements are quite sharp. As long as a binary options trader have enough knowledge about the impact of Fed rate on different currencies, handsome gains can be made in a short span of time. The federal funds rate is the interest rate used by banks to lend among themselves (trade balances held at the Federal Reserve) on an uncollateralized basis. The FOMC (Federal Open Market Committee), which is a branch of the US Federal Reserve, determines the course of monetary policy and makes discrete adjustments to its target for the Fed funds rate. The Fed achieves its objective by buying or selling government securities. The FOMC’s announcement to increase, decrease or leave the interest rates unchanged, stirs the financial markets as a whole and the currency market in particular. The financial markets build its opinion on Fed rates usually based on how healthy the US and global economy is. Low unemployment rates, high wage levels and low inflation data generally inspire a rate hike expectation. However, the FOMC’s decision may or may not reflect the opinion of the market. The reason is that the FOMC members may give more priority to certain issues (for example, the Shanghai market turmoil), which the market may temporarily discard. This will ultimately result in a decision that can sometimes surprise the market as a whole. The traders and analysts always look upon the Federal funds futures, traded on CME, for an indication of whether the market anticipates a change in the Fed rates. The reason is that futures market participants, before making contingent commitments, will always make a detailed study of those factors which influences the decision of the FOMC. Ultimately, the Fed will target the funds rate and the overnight rates will stay close to the Fed’s target. Thus, the Fed funds futures rate logically reflects the market’s anticipation of the course of the Fed Reserve. The Fed funds futures rate is quoted on an index basis. So, to arrive at the market’s expectation of the Fed funds rate, the Fed funds futures rate is deducted from 100. For example, if the Fed funds futures rate is 99 then the market’s expectation of the Fed funds rate is 1% (100–99). This means that an increase in the Fed funds futures rate indicates a corresponding decrease in the market’s expectation of the Fed rate. Each Fed funds futures (ZQ) contract is for $5 million with a 30-day expiry (last business day of the delivery month) period. At any point of time 36 contracts (starting from the current month) is being traded. Still, it is not an easy task to gauge the market’s Fed rate expectation based on the Fed funds futures. The reason is that large banks which are highly active in the spot market for Federal funds also use the Federal funds futures market to hedge against the spot market rate increases. This ultimately builds a premium in the futures funds rate as well. To put it simpler, there will always be a spread between the average Fed funds rates and the Fed funds futures rates. Additionally, the average Fed funds rates are also subject to settlement Wednesdays effect (final day of the reserve maintenance period when the funds rate will sharply rise or decline depending on whether the reserves are scarce or abundant). All these factors contribute to the complexities in the extracting the market’s expectation from the Fed funds futures rates. Thus, professionals always suggest inexperienced binary options traders (and other financial market participants alike) to refer to the opinion poll conducted (among leading economists) by the Bloomberg website for guidance. Additionally, a binary options trader should remember that largest price swings happen when the interest rates of two countries move in the opposite direction. However, temporarily, the US dollar may not react as expected even though the market will align itself along the fundamentals sooner or later. This is where the psychological factors such as the overall market sentiment come to play. There may also be a situation where the market would have already priced in the expectation. Under such circumstances, the market may under-react even to a rate hike with guidance for more. Similarly, a rate hike generally reduces the capital expenditure of the domestic companies, which may lead to decline in demand for equities and thus the currency. Thus, stock markets may react negatively to a rate hike. In the long run, as the US dollar starts flowing back into the US economy the indices would recover. Thus, it would be better for a binary options trader to think twice before taking any positions. A binary option trader can setup the following trades based on the Fed rate expectations and benefit from them. If a binary options trader expects a single rate hike with nothing more to follow in that year, then a call option contract can be bought in those currency pairs (or assets with direct correlation with the US dollar) that have the US dollar as the base currency. At the same time, a binary options trader can also purchase put option contracts on those currencies or assets which have an inverse correlation (as shown in the tabular column above) with the US dollar and are near the major resistance. Similar to the above trade, a binary options trader can purchase call option contracts in those currency pairs (or assets with direct correlation with the US dollar) that have the US dollar as the base currency. Since the rally may extend beyond a single day, a binary option trader can use the opportunity to enter fresh trades at regular intervals to squeeze out maximum profits. A put option contract can be purchased in those currency pairs or assets that have an inverse correlation with the US dollar. Again, systematic trades can be done at regular intervals to capitalize on the probable multi-day decline. If a trader expects only guidance but no rate hike expectation, then a put option contract can be bought on those pairs that have the US dollar as the base currency. A trader should be cautious to enter only near the resistance as the decline will not last longer. Alternatively, a call option contract can be bought on those currencies or assets that have an inverse correlation with the US dollar. In such cases, an entry near the support is ideal as the uptrend will last only for a short span of time. If a binary options trader does not expect any rate hike or guidance, then a put option contract can be bought on those pairs (or assets with direct correlation with the US dollar) that have the US dollar as the base currency. Additionally, a trader can enter new trades at regular intervals to capitalize on the probable multi-day decline. An entry near the resistance is always preferred. Alternatively, a binary options trader can enter a call option contract on those currencies or assets that have an inverse correlation with the US dollar. Needless to say that multiple trades can be done in a systematic manner at regular intervals because of the multi-day rise. An entry near the support is always better. A one-touch call option contract can be purchased in those currency pairs that have the US dollar as the base currency. The trade can be entered after taking into account the distance between the prevailing price and the one-touch call option target price. Alternatively, a one-touch put option contract can be purchased on those currencies or assets that share an inverse correlation with the US dollar. Such a trade should be taken only after taking into account the distance between the prevailing price and the one-touch put option target price. 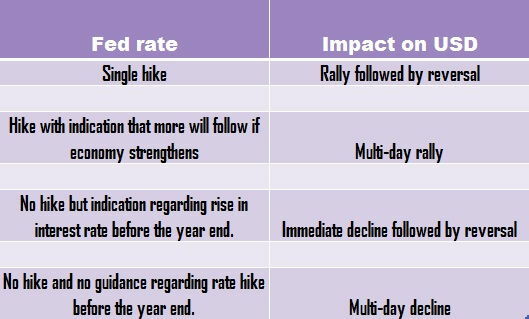 If a binary options trader expects multiple rate hikes then the trades mentioned in the above paragraph can be executed. Additionally, more trades can be entered at regular intervals based on the expectation that the rally on US dollar will continue for multiple days. However, it should be remembered that trades are to be taken only after checking out the distance between the prevailing price and the one-touch call option (in the case of currency pairs with US dollar as the base currency) or put option (currency pairs with inverse correlation against the US dollar) targets. If a trader expects no rate hike expectation but only guidance, then a one-touch put option contract can be bought on those currency pairs (or assets with direct correlation with the US dollar) that have the US dollar as the base currency. It is advisable to enter only if the one-touch put option target is not too far away as there will be a probable price reversal within a day. Alternatively, a one-touch call option contract can be bought on those currencies or assets that share inverse correlation with the US dollar. When a binary options trader expects neither a rate hike expectation nor guidance, then a one-touch put option trade (in currency pairs with US dollar as the base currency) can be executed as discussed in the above paragraph. Additionally, multiple trades can be performed in a systematic manner at regular intervals as the decline in the US dollar will probably continue for more than a single day. If a binary options trader expects only a single Fed rate hike for the year then a no-touch option contract (with no-touch target price below the prevailing price) can be bought in those currency pairs that have US dollar as the base currency. If the Fed rate expectation goes true, then the US dollar will go up temporarily thereby resulting in a profit. A binary options trader can also buy no-touch options contract with target price above the prevailing price in those currency pairs or assets that have an inverse correlation with the US dollar. Since there is a probability of price reversal within a day, timing the contract entry is very important. Only then an out-of-money scenario at expiry can be avoided. If a binary options trader expects multiple rate hikes for the year, then no-touch option trades can be taken as mentioned above. Since there is a probability of a multi-day rally, multiple trades can be taken on a systematic basis at regular intervals. If a binary options trader expects no rate hikes and only guidance for the current year, then a no-touch options contract with target price (no-touch) above the prevailing price can be bought in those currency pairs that have the US dollar as the base currency. Furthermore, those assets which have a direct correlation with the US dollar can be traded in the same manner. In case of assets or currencies having inverse correlation with the US dollar, a no-touch option contract with target price below the prevailing price can be purchased. Again, timing the entry is important because the US dollar will probably reverse within a day. When a binary options trader does not expect a Fed rate hike or guidance, then a no-touch option contract can be purchased as mentioned in the paragraph above. Additionally, a trader can plan to enter multiple trades in the same asset at regular intervals to capitalize on the multiple-day decline of the US dollar. If a binary options trader expects a single Fed rate hike for the year, then a double one-touch options contract can be bought after taking into consideration the price difference between the upper side target and the prevailing price of those currency pairs which have the US dollar as the base currency. Alternatively, a double one-touch options contract can be bought (after taking into account the distance between the lower side target and the prevailing price) in those currencies or assets that have an inverse correlation with the US dollar. If a binary options trader expects a multiple Fed rate hike for the year then a double one-touch options contract can be bought as mentioned in the above paragraph. Additionally, multiple trades can be made in a systematic basis at regular intervals as the US dollar rally would probably continue for more than a single day. If a binary options trader does not expect any rate hike but only guidance, then a double one-touch options contract can be bought after taking into consideration the difference between the lower side target and the prevailing price of those currencies which have the US dollar as the base currency. Even those assets which have a direct correlation with the US dollar can be considered. Alternatively, a double one-touch options contract with target price above the prevailing price can be purchased in those currencies or assets that have an inverse correlation with the US dollar. Timing the entry is important as the US dollar will probably reverse in a single day because of the guidance. A double one-touch options contract can be purchased as mentioned in the above paragraph in case the trader expects a no rate hike and no guidance scenario. Additionally, multiple trades can be executed at regular intervals in a systematic manner as there is a probability of a multi-day decline in the US dollar. A double no-touch option trade contract can be purchased only if the upper and lower no-touch target prices are far off from the current price of the currency pair that has the US dollar as the base currency. The same criteria are applicable to assets that have a direct correlation with the US dollar. Since the US dollar would probably rally initially and then reverse sharply, the no-touch bands should certainly be far off from the entry price. Again, in this case, the upper band of the double no-touch target contract should be far away from the prevailing price of those currency pairs that have the US dollar as the base currency. If not, it is better to avoid a trade as the US dollar would probably showcase a multi-day rally. On the other hand, if a binary options trader plans to trade a currency pair or an asset with inverse correlation with the US dollar, the lower band of the double no-touch target contract should be far away. If not, it is better to avoid the trade. A double no-touch contract can be purchased only if the lower band of the no-touch target is far off from the current price of the currency pairs with the US dollar as the base currency. The same rule applies to those assets that have direct correlation with the US dollar. In case of assets that exhibit inverse correlation with the US dollar, the upper band of the no-touch target should be far away from the present market price. If a trader expects no rate hike and no guidance, then it is better to avoid entering a double no-touch options contract as the currencies/assets having direct correlation with the US dollar will probably exhibit a multi-day decline and hit the lower boundary of the no-touch target bands. In the same manner, the assets having inverse correlations with the US dollar will continue to rise for more than a single day thereby violating the upper boundary of the no-touch target bands. Even though it looks quite simple trading the Fed rate expectations demand a lot of experience. Thus, a binary options trader should certainly practice on a demo account at least for two or three times before setting up the trade on a real account. For your information, FOMC meetings are usually held eight times per year.